A hovercraft is also called Air-Cushion-Vehicle (ACV). It uses a blower to create air currents beneath itself. Resulting in the formation of air cushion that slightly lifts the craft upward. This upward lift reduces the friction of hovercraft with the surface on which it moves. Also, the lift allows it to move freely in any direction when pushed. We will build a model of hovercraft out of home materials, and this it will use the same principle. Make a small hole in the center of the plastic bottle’s cap with a penknife (Be careful). Cover the center hole of the disc with bottle’s cap by putting it on top of the disc. Then, apply some glue to make air-tight contact. But, don’t apply glue on the hole of the cap. 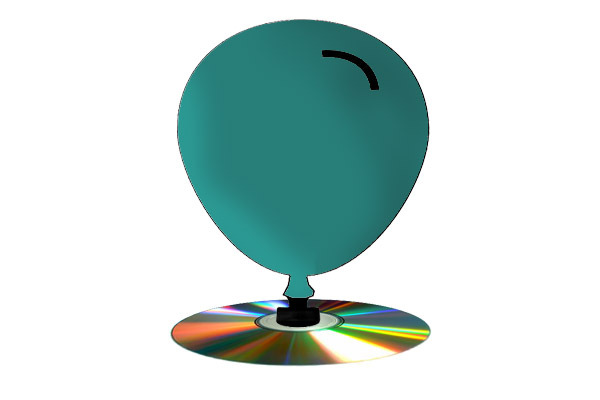 Blow up the balloon and pinch its mouth. Fit mouth of the balloon over the cap and release it. Your hovercraft is ready and working. Put it on a smooth surface, and push it in any direction you want. It will go there smoothly. Air from the balloon passes through a hole in the cap. Then, it flows beneath the disc creating an air cushion that slightly lifts the disc up. As a result, the friction between surface and disc reduces. This reduced friction allows the hovercraft to move freely in any direction where it is pushed. Use large size balloon, instead of small size balloon. Make two more holes in the disc and cover each hole with a cap. Then, blow three balloons and fit them to the caps (This is easy with three people each handling one balloon). Try to land your hovercraft on water and sand. Check out! How much weight your hovercraft can lift. Try with paper clips, pencils, and rubbers. Think! What can you do to increase the payload capacity of your hovercraft? Abdul Wahab, "How to Make Disc Hovercraft," in Science4Fun, April 13, 2019, http://science4fun.info/how-to-make-disc-hovercraft/.